Born in the year 1940, Dr. Mohamed Ali Mohamed Shukri passed out with a First Class Honours in Arts (Arabic) in 1965 from the University of Ceylon. Dr. Shukri was awarded a Commonwealth Scholarship to follow a Post graduate course at the University of Edinburgh, UK in 1973 and was awarded the Ph.D. in 1976. 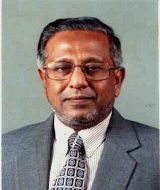 Dr. Shukri has held Lecturer, Head of the Department positions at the University of Kelaniya and University of Peradeniya and he is presently holding the position of Director at Jamiah Naleemiah, Beruwala, Sri Lanka, since April 1981. He has been a member of various committees and boards of management such as University Council of the University of Kelaniya, Muslim Religious Programmes Advisory Board at Sri Lanka Rupavahini Corporation, since 1998 and founder member of Al-Balagh Cultural Society for the Service of Islam on the Internet, Doha, Qatar, since 1999. Dr. Shukri has published various books. “Islam and Education”, “Mankind in Peril”, “Religion & Science”, “Islamic Life and Thought” are some of them. He has provided several research papers to learned journals and many international conferences. He has attended many international conferences such as “Silver Jubilee Celebration of Muslim World League, Makkah, KSA (1987)”, “International Conference for Future Directions for Muslim Corporation, Malaysia (1991)”, “Inauguration Ceremony of Al Balagh Cultural Society for the Service of Islam on the Internet (Islam Online), Qatar (1999)”, “International Conference on Dialogue held in Makkah, Organized by Muslim World League, June 2008”.